Any good designer will tell you that a neutral palette can be a great backdrop needed to create a well-curated interior. In fact, an amazing way to add a stylistic cohesiveness throughout your home is by sourcing neutral decor. In the past few years, this design theme was emphasized in the trending colors. Tans, various shades of gray and several white hues, were the must-have chic shades. However, “this year we have seen a significant shift away from neutrality in interior designs and step towards bright, bold and colorful shades” Sean Juneja, Décor Aid CEO. Integrating bold colors into your space will not only brighten the room but also give a sense of renewal and energy. Revamp your home’s design scheme and stay on trend by introducing pops of color. Be careful not to commit color overkill; this design technique is all about using just the right amount of color in your room’s design. Not everyone has the time and resources to look into how to incorporate color into their home’s decor successfully, so we’ve asked our interior designers to offer up their expert advice on the right ways to use pops of color in your rooms. Subtle enough to not overwhelm and outshine your space’s current color scheme, yet just as eye-catching painting the inside of your bookshelves is a great way to wake up any of your rooms without overshadowing the other decor. This design tip is for those who want to try out a new color but do not want to commit to painting an entire room or wall in a new shade. “Painting just the edges of the shelves will create a subtler look. Both options will draw visitors in and bring a sense of newness to your home if it needs a breath of fresh air.” David G.
If you don’t have a bookshelf in the room you are designing you can always try out painting the rooms doors and window frames. Another option is the reverse, paint your shelves gray and pair that with boldly colored furnishings. So incorporating artwork, accent walls and painting are great ways to add pops of colors. However, not everyone wants to paint. Why not upgrade your sofa or dining chairs? Sourcing a sofa in bold fabrics or one with bright and chic patterns will also add a pop of color. A more affordable approach is to add colorful armchairs, which will bring a stylish contrasting compliment. “I encourage all of my clients to have fun when designing any room in their house. I also tell them not to be afraid to add pieces they think might not match their neutral decor.” Nicolle N explains. When looking to revamp your dining room, a bold color idea is to source chairs in different shades. Statement colors like yellow, really shine when paired with a neutral interior. When designing any room don’t forget that contrasting bold and neutral is just what you need to complete the look of your home. 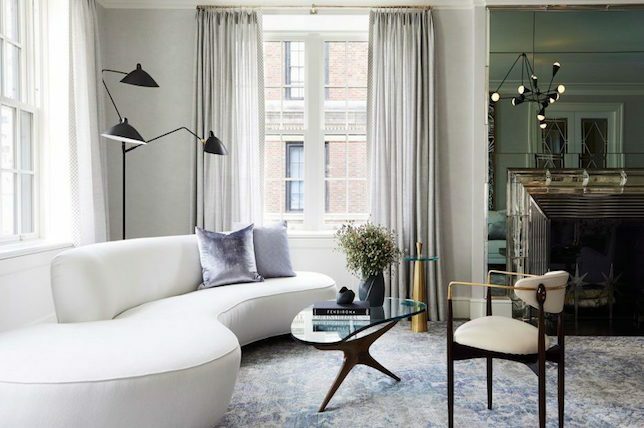 “I’ve found that clients who are reluctant to change are more willing to incorporate bolder designs when they are presented in the form of smaller accents like throw blankets, pillows and vases.” Designer Ali reveals. Accent pillows are great for those who aren’t sure which bold color will work best for them. You’ll be able to try on oranges, blues, and other bold shades until you find the perfect color. Make sure you source several pillow covers, this way you can easily switch colors if you haven’t settled on a particular color. Smaller accent pieces provide pops of color that are examples of the right amount of color needed to make a space feel renewed and refreshed. Like many other tricks mentioned, this is also a great way to incorporate your personality into your space. If you have a gallery of art displayed in your home already or are thinking of adding one, you should know this is an amazing opportunity to add a pop of color to your room. Statement blues, tonal reds, and energizing oranges are shades that would make for a brilliant gallery backdrop. “An accent wall is a great way to create a focal point in any space when paired with art. You’ll see how the pigmentation in the wall color makes the color in your art vividly pop.” Designer Kimberly P.
In other words, painting a gallery backdrop in vibrant shades helps create an eye-catching focal point. Neutral colors like gray and ivory would not produce the same effect, resulting in a lackluster accent wall. Painting your doors, window frames and trim lets you integrate a bolder color, such as red, in just the right amounts. This trick ensures that the previous color scheme is complemented rather than overshadowed. “Painting window frames and trim in colors that are bright and airy will lead the eye to the natural light coming in. I use this design trick when I am designing a small space because it helps the room appear expansive and roomier than a cooler shade would.” Maria T explains. Not only will painting your home’s doors and window frames provide a much-needed pop of color, but this is a trick many designers use to help incorporate the character into their client’s homes. No one wants to repaint something they just painted, but if you don’t like the color, you only have the frame or trim to repaint versus repainting four walls all over again. Before 2018 started, most designers were predicting the end of the neutral color dominations, which meant many would be saying goodbye to the classic, traditional all-white kitchen. Decorating with brighter colors is an excellent interior design idea for those looking to make a room pop with color. A great place to start adding bolder colors to your previously all-white kitchen is the cabinetry. No need to worry about color clashing because vibrant shades like crimson or marmalade will look great with pre-existing hues and materials already found in your space. V or tonal reds will subtly compliment various wood tones, stainless steel, and other mixed metals as well as stones like quartz and granite. Incorporating your art into your home can seem like a daunting task for some, but it doesn’t have to, and it’s worth a try because through the pieces you curate, you can revamp a space and give it the color it was missing. There is no need to worry about what kind of art to go with, visit galleries, then when shopping let choose a colorful piece that speaks to you the most. You’ll add a pop of color and personality. “Colorful art pieces have eye-catching designs and will be a bold contrast every time. I always source art for my clients when working with a room that was previously designed with a neutral palette. Art is the perfect way to incorporate beautiful hues into your otherwise neutral space.” Pamela S adds.